All transactions are safe and secure with a reliable history in online purchasing behind each of our associates. Buy the Black and White Striped Pugsley t-shirt to own Addams Family clothing and merchandise. 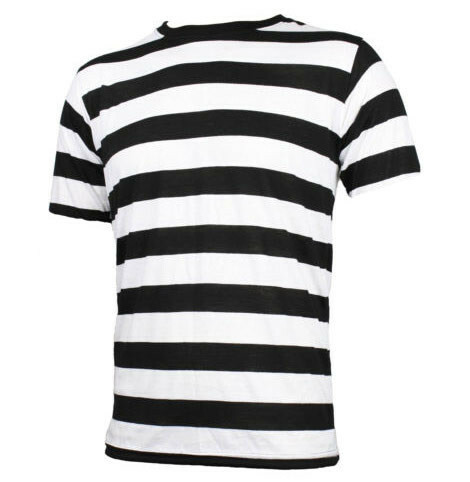 This black and white striped Pugsley Addams shirt style can be combined with a pair of black shorts and a little hair gel for a front flip to create the perfect Pugsley Addams costume. If dressing up for Halloween or parties just isn't you, then keep scoping out our assortment of Addams Family shirts like the Cousin Itt t-shirt. The Addams Family Camp Chippewa designs are also worth a look. In addition to the Black and White Striped Pugsley tee above, browse the Addams Family Clothing Gallery for more apparel like men's and women's clothes, kids shirts or hoodies.